T-Mobile USA has announced that it is pushing the Android 4.1 Jelly Bean update to the Samsung Galaxy S III beginning today. The update can be downloaded over the air or installed via Samsung's Kies desktop software. T-Mobile today announced its initial batch of handsets compatible with the new Isis mobile payments service are the Samsung Galaxy S III, Galaxy S Relay 4G, and the Galaxy S II. Owners of these handsets in the trial markets of Austin and Salt Lake City can go to their local T-Mobile store to receive the special SIM card needed to activate Isis. T-Mobile expects the Galaxy Note II and the HTC Amaze 4G will be Isis compatible by the end of the year. Isis lets Android smartphone owners make tap-and-go payments with their handsets at select retailers. Samsung today announced that Android 4.1 Jelly Bean will be made available to all U.S. variants of the Galaxy S III in the coming months. The update will be provided both over-the-air and via Samsung's Kies desktop software. Timing for the update, however, will be up to Samsung's individual carrier partners. The GS3 is sold by AT&T, Sprint, T-Mobile USA, U.S. Cellular, and Verizon Wireless. So far, none has said exactly when Jelly Bean will become available. Samsung said that the Android 4.1 update will make improvements to the camera, add an Easy Mode for first-time smartphone owners, add the Swype keyboard, and make it easier to block calls/numbers. These new features are in addition to those that come with the Jelly Bean operating system, which include Google Now, improved notifications, adjustbale widgets, and others. T-Mobile USA is pushing a minor maintenance update to its variant of the Samsung Galaxy S III. As with similar updates provided by other carriers, the update removes the universal search function from the T-Mobile version of the device. Apple holds a patent for universal search, and Samsung previously said it was removing the feature form its devices as a preventative measure. According to T-Mobile, the update also makes some minor performance improvements. Samsung today provided an explanation of sorts for recent system updates sent to U.S. versions of the Galaxy S III. Both the Sprint and AT&T variants of the GS3 have been updated in recent days with a patch that removes the Universal Search function — a feature for which Apple has an existing patent. "Samsung has updated the software for the Galaxy S III as a precautionary measure to ensure that U.S. consumers may enjoy using our innovative products without interruption," said Samsung in a statement provided to Phone Scoop. Further, Samsung said that this statement does not yet apply to the T-Mobile or Verizon Wireless versions of the GS3. Those two variants have not received updates removing the Universal Search function, and it's not clear if or when they will. Samsung has partnered with Media Mushroom to offer a content-porting app called Easy Phone Sync. The tool allows PC or Mac users of iOS devices such as the iPhone or iPad to easily transfer iTunes content to a Samsung Galaxy smartphone. In order for transfers to work, users must install the app on their computer as well as the Galaxy smartphone. The transfers require a USB cable. In addition to music and movies, Easy Phone Sync will transfer contact data, messages, and photos. Both the mobile and desktop clients are available for free. T-Mobile USA has revealed the price points it will charge customers for the Samsung Galaxy S III. It is offering customers two options. Those who choose to sign a traditional two-year contract can purchase the 16GB Galaxy S III for $279.99 or the 32GB version for $329.99. Both these prices reflect the final cost after a $50 mail-in rebate. T-Mobile is also offering the Galaxy S III via its Value voice and data plans for a down payment of $229.99 for the 16GB version or $279.99 for the 32GB version. Customers will then have to make 20 equal monthly payments of $20 via T-Mobile’s Equipment Installment Plan. AT&T, Sprint, and Verizon Wireless are charging $199.99 and $249.99 for the 16GB and 32GB versions, respectively. As for availability, the Galaxy S III is available via select T-Mobile retail locations and via T-Mobile's web site starting today. T-Mobile expects the Galaxy S III to become more widely available next week. Samsung today announced that it will sell the SAFE Galaxy S III, a business-ready version of the Galaxy S III Android smartphone, via AT&T, Sprint, T-Mobile USA, U.S. Cellular, and Verizon Wireless. SAFE stands for "Samsung Approved for Enterprise." The SAFE Galaxy S III includes business-friendly features such as IT policy support, AES-256 bit encryption, expanded business features of Microsoft Exchange ActiveSync, and support for virtual private networks and mobile device management tools. In addition to the SAFE-branded Galaxy S III, Samsung is also offering potential business customers a trade-up program called SAFE2SWITCH, which provides "competitive pricing" for devices that are traded in and/or recycled when purchasing a SAFE Galaxy S III. The SAFE-branded Galaxy S III will be available from the above U.S. carriers by July. 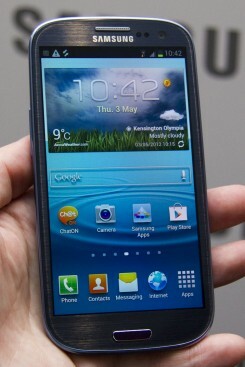 Samsung didn't say if pricing for the SAFE Galaxy S III would differ from the retail version being sold to consumers. Samsung already offers a SAFE variant of the Galaxy Note. U.S. District Judge Lucy Koh earlier this week squashed Apple's move to prevent Samsung from launching the Galaxy S III in the U.S. on time. Apple had requested an emergency court order to block the S III based on patent complaints. The judge said Apple's request would put too much pressure on her court's calendar. Koh is overseeing the Apple-versus-Samsung trial that is set to get under way next month. Apple has filed a petition with the U.S. International Trade Commission to prevent Samsung's Galaxy S III from entering the country. Apple believes the device violates its intellectual property. Samsung vowed to fight Apple's newest salvo in the smartphone patent wars and said in a statement that it will "demonstrate to the court that the Galaxy S III is innovative and distinctive." Apple wants to block the device before it goes on sale, but Samsung believes the device will launch on schedule. It can already be pre-ordered from several U.S. carriers and is expected to reach store shelves in the coming weeks. Sprint and T-Mobile USA today announced that the Samsung Galaxy S III will be available online and in stores starting June 21. Both carriers will sell the white and blue colors in 16GB and 32GB variants for $199 and $249, respectively. The Sprint variant will include Google Wallet for mobile payments. Sprint will open preorders for the S III June 5. T-Mobile has not yet announced if or when the S III will be available for preorder.